Most credit unions now offer convenient and secure mobile online banking for their members, as well as many other time-saving technologies – so it comes as no surprise that members would appreciate the ability to vote in credit union elections as quickly and easily as they manage their finances. 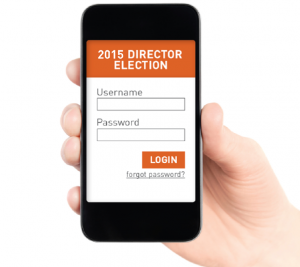 With the same level of security as mobile banking, the time to bring elections to your members’ smart devices is now. The majority of adults in the U.S. – 84 percent – use the Internet and 64 percent of Americans use a smartphone to access the Internet. In fact, 10 percent of Americans use their smartphone exclusively to access the Internet and the average amount of time spent online is 11 hours per day, according to the latest numbers from the Pew Research Center. Each year, we see an increase in credit unions and other member organizations adding online voting as an option. To date, we have also seen that 15 percent of web voting is done via mobile device. Online and mobile-friendly voting options are only going to become more popular each year, so it’s important to make sure each member gets an optimal voting experience tailored to the device they’re using. When credit unions don’t offer online voting, members are less likely to engage because voting becomes an inconvenience. And without mobile-friendly voting options, members are forced to scroll and zoom, and many website features simply don’t work on mobile devices. Reducing the limitations of where a member must vote and making your voting site mobile-ready helps eliminate these pain points. Save money that would normally be used on the design, printing and mailing of paper ballots. Online voting can be great for the bottom line. A simple way to vote anywhere increases voter participation and overall member engagement. A convenient election with many voting options increases member satisfaction toward the election and the credit union itself. Thousands of credit unions are safely and successfully implementing online and mobile voting technologies, and trust us, interest is rapidly growing. Allowing your members to log on securely anywhere, anytime makes your voting process more engaging and effective. Contact us today and we’ll share some great examples of credit unions who have successfully implemented online elections and mobile voting technologies! Next Next post: How Does an Onsite Election Work?